This entry was posted in Uncategorized and tagged afternoon sun, agriculture, combine, copyright ryan ware, field, harvest, soybeans. Bookmark the permalink. I agree. 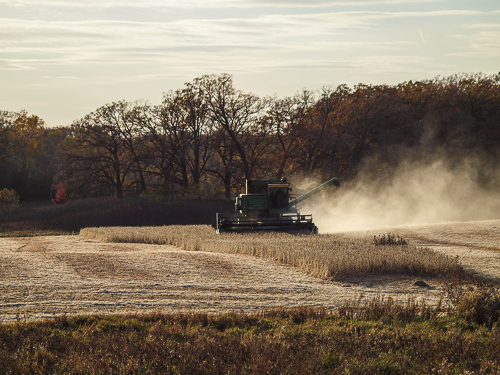 Beautiful, beautiful photo that really makes me miss living on the farm during harvest in southwestern Minnesota. I thought you lived close to farm country, or don’t you? This was a couple miles west of where I live now, which of course is quite a contrast from where I work every day. Yup, Ryan, I live in Faribault, with farm country edging my community. But farmland around here isn’t the same as the prairie, it just isn’t. And observing and living on a farm and experiencing harvest close-up are two very different things. It is the “living the harvest” that I miss.